A little while ago I promised to keep it real by posting more easy weeknight dinners. Nothing fits that bill more snugly than a frittata. Eggs aside, you could pretty much substitute any ingredient on this list with any other vegetable, meat or cheese in the world and still turn out something edible. 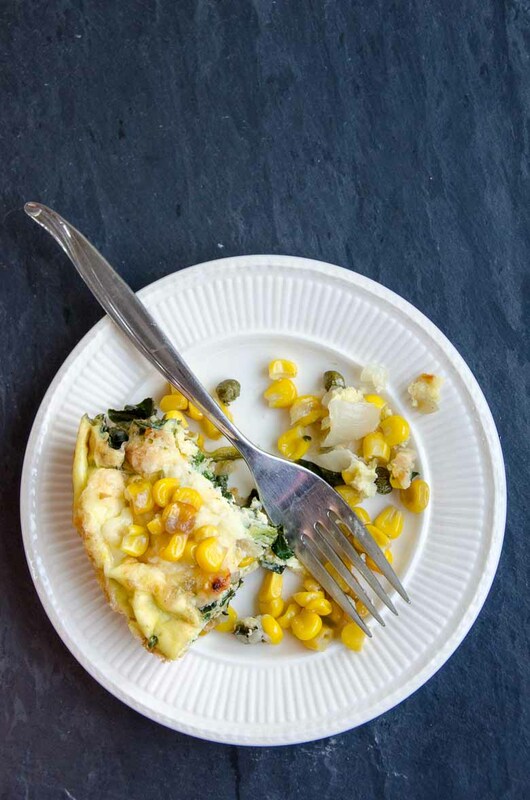 Still, I’m posting this particular combination: Frittata with corn, cheddar, and spinach, because we liked it a little extra. Slap some bread in the toaster and call yourselves fed. There’s enough spinach in here that a salad is completely optional. Frittatas are eminently flexible. 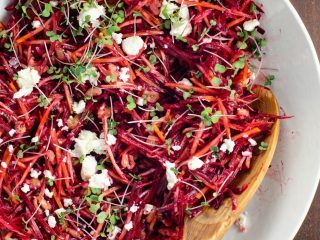 Swap in different vegetables, meats, herbs, and cheeses if you like (though we're big fans of this combination in particular). 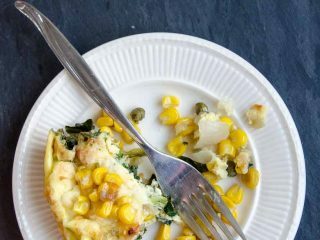 This flavorful frittata has a great balance of tastes and textures, from briny capers to lightly sweet corn. It's an easy weeknight meal. Preheat the oven to 375°F or the broiler to high. Place a rack 6 to 12 inches from the heat source. Warm the oil or butter in a large frying pan over medium-high heat. Add the onion along with a good sprinkle of salt and cook until starting to soften, about 5 minutes. Adjust the heat as necessary to prevent too much browning. Add the corn (straight from frozen is fine) and the capers and cook for a few minutes until warmed through. Stir in the spinach a little at a time, adding more as it wilts. Sprinkle with a little more salt and cook until spinach is just wilted. Scramble the eggs and pour them evenly into the pan. Place the cheddar on top. Transfer frittata to oven and bake or broil until set (or a little longer if you prefer a brown top and firmer eggs).